Happy Melbourne Cup day everyone! I hope you're all getting into the spirit of things...OR taking advantage of the holiday to do something fun. 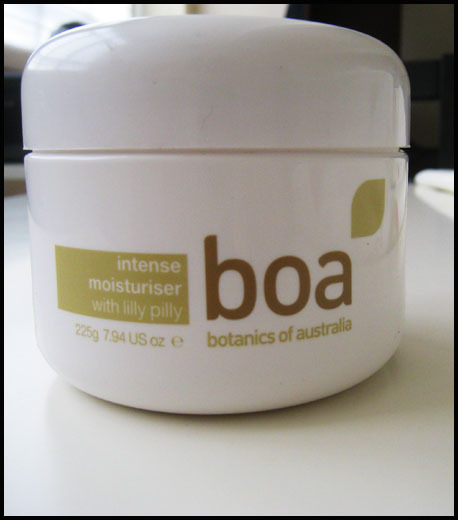 I'm supposed to be preparing for this hearing I've got tomorrow morning, but I thought I'd post a quick review first - this is the Botanics of Australia Intense Moisturiser with lilly pilly. This luxurious cream contains Vitamin C and fruit acids which act to regenerate the skin and prevent damage to skin’s cell structure. It hydrates and cleanses the skin, leaving it fresh and restored. When I received this moisturiser, I was really excited about trying it out myself. But that same day, over dinner, my sister started asking me about body moisturisers because she just finished the tub that she was using, and it wasn't doing a very good job because she still had these really bad, deep cracks in the skin on her legs. I asked her to give this a try, and she was extremely pleased with the result. This moisturiser is very rich, and has a slightly waxy feel to it. It smells lovely and flowery - none of that artificial cheap chemical smell. My sister has been using this for quite some time now (only about 1/4 of the tub is left), and she has reported smooth skin, no cracks, and no scars. The moisturiser is really rich and very hydrating. All the deep, bleeding cracks that she used to have are now completely gone, and she loves it! I have to admit that she didn't like it at first - she said that it was way too rich and felt greasy on her legs. But all that doubt is long forgotten now that she's seen the results! I'm pretty keen on this moisturiser myself. I mean, how could you not want to go out and buy a tub after reading a review like that?! I also love being able to dip into a big tub of moisturiser at the end of a long day - there's just something about it that makes me feel so old-school glam and luxe. Am I the only one who feels this way? If you want in on some of this hydrating action, Botanics of Australia can be purchased online (they offer international shipping!) at FashionAddict for only AUD 12.95 per 225g tub!